Each spring I always get inspired to paint about the life that seems to burst forth after a long cold winter. As I drive to visit the Smoky Mountains each spring, I feel almost like a bluebird going back to its summer home. On a recent trip to Cades Cove, I became fascinated with the lifestyle of the early settlers. Its sad to see their skillfully handmade tools lying around to pass into history, having now been replaced by modern machines. In this painting, two of our favorite feathered friends rest for a moment on the handle of a horse drawn plow. Soon they will fly off and build their nest in what used to be home to a now outdated way of life. 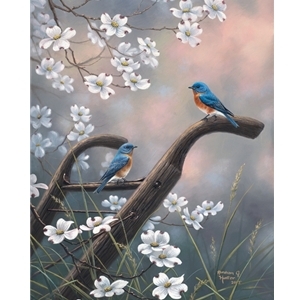 As spring returns, and new life is given to the land, we can revisit the time of sowing and reaping and celebrate with these bluebirds as they build their new home.